We’d love your help. Let us know what’s wrong with this preview of Heavenly Signs III by Mel Gable. "Is it man's doing and God's will that the United States of America is doomed to fall? There are significant historical events that have caused the current conditions in this country. 'The eagle has risen' and 'the eagle falls' echo how far society has come and beg theses questions: Have we been here before? Does history repeat itself? Where is America heading, and is the "Is it man's doing and God's will that the United States of America is doomed to fall? There are significant historical events that have caused the current conditions in this country. 'The eagle has risen' and 'the eagle falls' echo how far society has come and beg theses questions: Have we been here before? Does history repeat itself? Where is America heading, and is the world following suit? 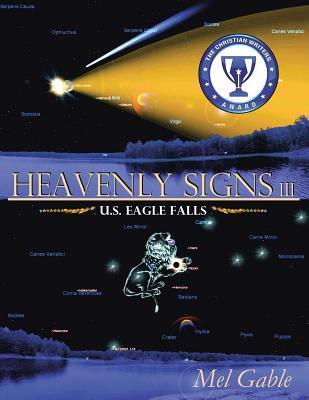 This third book in the Heavenly Signs series is entitled US Eagle Falls. 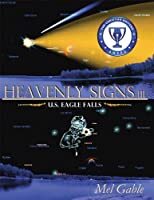 Author Mel Gable researches the components that are playing into this scenario and again studies the heavenly signs to answer these questions. It will be very clear to us if we keep looking up. Are you well-versed in what is happening today? Mel Gable explains in an orderly fashion the connections among science, the Bible, and history and masterfully shares his insights to enlighten us, the readers. Even though wickedness abounds, the author makes it clear that the Master Planner is in control and that His perfect plan will come to fruition. We need to place our faith and trust in our all-knowing God." To ask other readers questions about Heavenly Signs III, please sign up. Author Mel Gables deliver another well written book, showing a lot of research and in particular with this volume, a lot of personal opinion on abortion, gay marriage, separation of state/religion and other controversial topics. He makes crystal clear his position according to the Scriptures from the Christian faith. This is a very serious topic that Mr. Mel deals with mastery and no matter what the heavenly signs say, we have a lot to correct on our nation's behavior in order to go back to the Author Mel Gables deliver another well written book, showing a lot of research and in particular with this volume, a lot of personal opinion on abortion, gay marriage, separation of state/religion and other controversial topics. He makes crystal clear his position according to the Scriptures from the Christian faith. This is a very serious topic that Mr. Mel deals with mastery and no matter what the heavenly signs say, we have a lot to correct on our nation's behavior in order to go back to the track that pleases God and bring us prosperity. He reminds me Jonah and his role as a prophet bringing to Nineveh the message of imminent destruction if the population of the city does not repent from their sins. Mel here is acting as a prophet to our nation and I could not agree more with his firm position on the moral degradation that our country is experiencing. The only major detail here is that he put some dates on this imminent judgement that God is about to do based on heavenly signs, like eclipses, comets and red moons. This is a must read book to any person that cares about the USA.